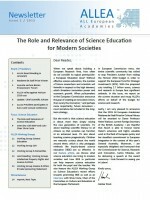 ALLEA’s recently released first newsletter of 2015 focusses on the topic “The Role and Relevance of Science Education for Modern Societies”. In this context, the newsletter features an interview with MEP Silvia Costa, Chair of the Committee on Culture and Education as well as a section highlighting investigation-based science education (IBSE). This issue also reports on a variety of activities and developments within the scope of ALLEA. We often speak about building a European Research Area, but what about its logical prerequisite: a European Education Area? Science education is key for not only inspiring and preparing the future generations of scientists and researchers to engage in scientific careers, but also for increasing the overall scientific literacy in our societies, which plays a major role in preparing citizens to take part in scientific debates – for example, in situations where politics and science intersect and require the votes of the public. Thus, with this newsletter’s focus topic, ALLEA offers an overview of the role and relevance of science education for modern societies. The accompanying ALLEA interview with Silvia Costa, Chair of the Committee on Culture and Education (CULT) at the European Parliament, offers a glimpse into the perspectives of CULT regarding science education. Moreover, the newsletter explains the importance of IBSE as a pragmatic approach towards providing effective science education to young pupils. Additionally, this newsletter issue recaps numerous developments regarding science policy and the EFSI regulation and details ALLEA’s recent activities vis-à-vis the European institutions. It also reports on thediverse recent activities of all five ALLEA Working Groups, who perform the bulk of ALLEA’s scientific work. The newsletter furthermore announces the 2015 recipient of the All European Academies Madame de Staël Prize for Cultural Values, Dame Helen Wallace of the British Academy, who will be awarded the prize by the European Commissioner for Research, Science and Innovation, Carlos Moedas, in the context of the ALLEA General Assembly on 23 April 2015 in Lisbon.